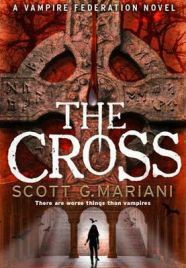 The Cross is the second novel in Scott G. Mariani’s Vampire Federation series. Having read and thoroughly enjoyed the first instalment, The Uprising, when it was a Kindle freebie, I was more than happy to pay for The Cross – although currently it is only 99p on Kindle. The Cross opens more or less immediately after the end of The Uprising. Our leading man, Joel, is still in Romania after the showdown with Gabriel Stone and his “traditional” vampires, which were rebelling against the Federation, which polices vampire behaviour. Joel is not the same man as he was in The Uprising however, and has to come to terms with the monumental change in his life. Alex, a vampire and Federation agent, returns to London to report on what happened. However, the story is far from over, and neither is the battle against the traditionalists. The Uprising introduced us to the main characters of the series, and so there is less of this in The Cross – Mariani gets straight into the fast-paced action which characterised The Uprising. There are new characters of course: a self-proclaimed vampire hunter who is clearly ridiculous, and we also meet Chloe, who doesn’t believe in vampires but does want to hunt down a man who believes he is vampire. Chloe is a good addition to the main characters, teaming up with Dec, who lost his girlfriend in The Uprising. As I have already mentioned, The Cross is fast-paced. It is packed full of action, and flows seamlessly between the various characters and the storylines they are embroiled in. There is a similar structure to The Uprising, but the story has progressed so that doesn’t matter. Again we have a big showdown between goodies and baddies in a remote location in Europe, although there is a twist in the tail when an unlikely alliance is formed. In a Q&A published in the Kindle edition of The Uprising, Mariani said he was aiming for a cross between a modern thriller and a gothic horror such as Dracula, which could be seen in his use of Romania as a location. The Cross is still very much a modern thriller, but has a touch of James Bond about it – the archvillains are located in Siberia, and their stronghold (which we see a lot more of than in the first novel) seems almost like somewhere a loony Bond villain would create. The final showdown takes place in a luxurious ski cabin in Switzerland, where you can almost imagine Bond dropping into by parachute. The Uprising surprised me when I read it, as it was one of my first free Kindle books – I had half expected it to be rubbish. I rather expected to be disappointed by The Cross – I had enjoyed the first one so much, and wasn’t sure if Mariani would follow up well, but he certainly has. The Cross is an excellent continuation of the story, fast-paced, full of excitement and great characters. The ending indicates that the story is by no means over, so I look forward to the next installment. No Comments on "The Cross"